Chad le Clos gatecrashed the party of the world’s men’s elite freestyle sprinters when he raced his way to a memorable silver in the 200m final to earn South Africa’s second Olympic medal of Rio 2016. “Not bad for a fly guy,” he probably said to himself after breaking the South African and African record in the process. Le Clos came second to Yang Sun – who won with a time of 1:44.65. Le Clos’ time was 1:45.20, adding another silver to South Africa’s medal tally. Within 58 minutes he was stripped and ready for action again, this time bidding to reach the final of the 200m butterfly, the event in which he announced himself as Michael Phelps’ heir in the London 2012 Games. During those 58 minutes ready room footage emerged of him apparently taunting the American, in classic antagonistic boxing fashion. Renewing rivalry with Phelps after the pair had seemingly strayed from the path of a close friendship, Le Clos could only manage third in a semi-final won by Hungary’s Tamas Kenderesi, who hauled in Phelps close to home, with the Olympic champion a well beaten third. Kenderesi qualified fastest for the final, an eye-catching 1min 53.96sec, with Phelps second in 1:54.12 and Le Clos next best in 1:55.19. He was 0.01 seconds slower than the pre-Games favourite Laszlo Cesh and with the London 2012 gold medal-winning time being the South African’s 1:52.96, one imagines a 1:53.50 might well win it on Tuesday. Le Clos was quite clearly feeling the effects of winning that 200m freestyle silver medal when he took to the water for the butterfly semi-final and afterwards an anxious coach, Graham Hill, was keen to get his charge away from the expectant media and given the opportunity to shake the lactic acid out of his legs. “With his race being so late [it was 11.25pm local time when he got out the water after the semi-final] there’s such a short turnaround time before the final,” the coach said. And what did Hill, whose travelled a long path with Le Clos, think of the “surprise” freestyle silver medal? “Surprise? I’m surprised he didn’t win gold!” He was only half-kidding, because what the South African almost pulled off was one of swimming great heists. Just 24 hours earlier Le Clos had qualified for the final of the 200m freestyle, but only after tying up in the last 10 metres, ultimately qualifying seventh fastest, but still earning a place amongst the elite. When told “23.91”, he replied, “Wow, that’s fast! That’s fast! I went out a bit too fast. I want to get out there, always go hard, against the best guys in the world. “‘I struggled a bit tonight, and when I turned at the 100, I didn’t know what to do, I’ve never been this far ahead, ever, my whole life. I like to race. In the last 10m I was hurting a bit, and I knew that, like this morning as well, I’d gone slightly too fast. I need to pace myself slightly better,” he said. Well, when it came to the final, Le Clos, whose odds had drifted from 6-1 to win gold to 25-1 in the wake of that semi-final, again left the blocks like a bullet from a barrel. He got to 50m in 23.39, a half second quicker than he had gone in the semi-final. “I need to pace myself better,” he had said after that semi. Here he was going quicker. Le Clos had hoodwinked the opposition. Racing on the outside in lane seven he’d been the proverbial greyhound chasing the hare and he nearly pulled it off. A body length clear after the first 50, into halfway at 50.36 – nearly a full second up on American Conor Dwyer. The South African, a born racer, wasn’t going to come back to the field, as he had in the semi-final. Suddenly, the pack started to get into gear but Le Clos was clear. Still leading at the 150m turn, they looked, for all money, that they weren’t going to catch him. Then the favourite, Yang Sun, came bursting through, sixth at 50m, fifth at halfway, third at 150m. 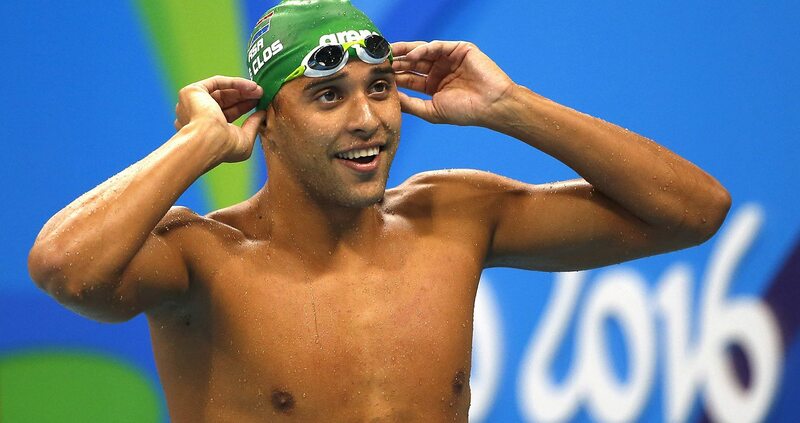 He closed fast, with a final 50m swum in 26.71 – Los Clos, tiring, clocked 27.49 – to haul in the South African late. But silver was his. An unlikely silver, it must be said. Although perhaps not. He trampled all over his own PB, a 1:45.89 set in Sunday’s heats, and charged over Jean Basson’s African record of 1:45.67 set in 2009. Before the race he had predicted 1:44.9 would win bronze. He didn’t need to go that low, but that time will come. “I think this [medal] shows I can do anything I put my mind to,” Le Clos told the media afterwards.